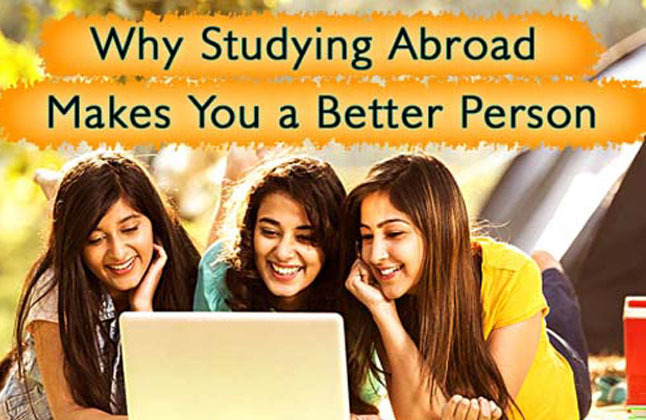 Studying abroad is a life changing experience, and while earning your degree in a foreign country provides you with several personal and professional benefits, the international experience that you gain will make you more attractive to companies that are eager to hire graduates who are flexible, multilingual, and comfortable in multicultural settings. A study abroad program will help you accept and face new challenges, be innovative in your thinking and will test you on your problem solving abilities. Studying abroad provides a great opportunity to develop and strengthen your interpersonal and intercultural skills and will set you apart in the job market. Intercultural skills have become increasingly important in today's workplace, and will help you interact with people from different cultural backgrounds. Interpersonal skills are personal qualities that relate to how you interact with people and solve problems. Good interpersonal skills improve your productivity and are highly valued by employers. Depending on where you choose to study overseas, you may be required to learn an additional language. In addition to being able to interact with the locals, learning a new language can also help you seek employment after your study abroad program. There are several jobs where speaking multiple languages can prove to be beneficial. You may be required to travel abroad on business trips or even move to a new country if you know an additional language. A study abroad experience can be important for your future career. It provides you with several opportunities. Being able to adapt to an entirely different education system from the one that you had back home is an advantage in itself. It shows employers that you possess the dedication and the will power to adjust to any given situation. Studying abroad provides you with a new perspective on culture, language skills and a willingness to learn which are all very attractive to future employers. Being flexible and efficiently handling new situations are skills that most employers look for in potential candidates. Meeting new people and experiencing different cultures will help you learn more about yourself. By doing this, you will be able to broaden your outlook from a more international perspective. The experience of studying abroad shapes you as an individual and makes you aware of your strengths and weaknesses. In addition to strengthening your communicative and interpersonal skills, a study abroad program also shows employers that you're not afraid to take initiative. Employers need to know that they can rely on you to make the right decisions. Studying abroad is one of the most life changing and transforming experiences students will go through. For many, it provides focus, motivation, and in some cases may change life goals completely. But for nearly every student, the experience of studying abroad creates a heightened sense of maturity, independence, and responsibility, all traits essential for an internship or a full time career. Many students create travel blogs, when studying abroad to document and share their experiences with friends and family back home. These online blogs show employers that in addition to being familiar with creating online content, you also possess written skills. The experience that you have with social media is an asset and should be added to your resume, it shows employers that you are familiar with the internet. Studying abroad is an exciting opportunity to make new friends. It is rewarding learning from people with different backgrounds, and may even provide a wealth of new contacts from around the world. This is your chance to meet people with different types of jobs. Stay in touch with them, you never know which one of them may enter into business with. Moreover, you will also have the experience of working with a diverse team. Meeting people from different walks of life teaches you that there is no right way of doing something, but a different approach. You will learn to be more patient, to listen to others' opinion and make decisions based on an informed opinion. Employers look to hire people that can adjust to changing situations. When you study abroad, you start to develop skills that will set you apart from the other candidates such as building cross cultural communications, a better understanding of the country's heritage, culture and values. Extra-curricular activities during your time overseas is an added advantage on your resume, these may include interning in a company, doing volunteer work or part time work. The activities that you participate in gives you valuable experience and can boost your career prospects.